This product is no longer available and has been replaced by: 108. The 108-LC is a version of the 108 that has a cable terminated in a connector rather than the standard pigtails. The connector can be attached to the CS110 lightning meter or to the ET107, ET106, or MetData1 weather stations. The 108-L is a rugged, accurate probe that measures temperature of air, soil, or water from -5° to +95°C. Designed for durability and ease of installation/removal, the 108-L easily interfaces with most Campbell Scientific data loggers. 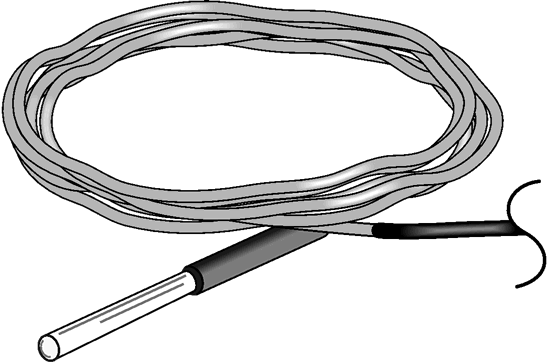 For this version of the 108 thermistor, the cable terminates in a connector rather than the standard pigtails. The connector can be attached to the ET107 Weather Station, ET106 Weather Station (retired), or MetData1 Weather Station (retired). The 108-LC can be used to accurately measure the temperature of a variety of media, most commonly air, water, and soil. It consists of a thermistor encapsulated in a cylindrical aluminum housing. The 108-LC measures the range of -5° to +95°C; to measure the -35° to +50°C temperature range, see the 107-LC probe. The 108-LC is suitable for shallow burial only. It should be placed horizontally at the desired measurement depth to avoid thermal conduction from the surface to the thermistor. Placement of the sensor cable inside a rugged conduit may be advisable for long cable runs, especially in locations subject to digging/mowing, traffic, use of power tools, or lightning strikes. The cable of the 108-LC provides a connector that attaches to the ET107 Weather Station, ET106 Weather Station (retired), or MetData1 Weather Station (retired). The ET107 Weather Station has an on-board CR1000M module. Both the MetData1 Weather Station and ET106 Weather Station have an on-board CR10X module. When exposed to sunlight, the 108 must be housed in a radiation shield. It is typically housed in a 41303-5A 6-plate naturally aspireated shield. It may also be housed in a 41003-5 10-plate shield if a 41322 Adapter Plate is used. To measure large numbers of probes, the AM16/32B multiplexer is recommended. How are temperature sensors such as the 107, 108, 109, 110PV-L, and BLACKGLOBE-L calibrated? When these sensors are purchased, the following calibration services are offered: TEMPCAL and TEMPCAL2. TEMPCAL provides a single-point calibration and a calibration certificate. The single-point calibration determines the offset at 25°C with an uncertainty of ±0.05°C. TEMPCAL2 provides a two-point calibration and a calibration certificate. The two-point calibration determines offsets at 30°C and 65°C with an uncertainty of ±0.05°C. For both of these services, calibration can be made at different values if it is requested by the purchaser at the time of purchase. In addition, both of these calibration services can be requested after sensor purchase using a returned material authorization (RMA) number. To request an RMA number, refer to the Repair and Calibration page. How can measurements be made using a 107, 108, or 109 temperature sensor/probe with a measurement device other than a Campbell Scientific data logger? To measure the sensor/probe, the measurement device has to provide a precision excitation voltage (Campbell Scientific data loggers use 2000 mV), measure the voltage across the precision resistor, determine the thermistor resistance (Ohm's law), and convert the resistance to temperature using the Steinhart-Hart equation. What are the different cable length choices available for Campbell Scientific sensors? An –LC model has a user-specified cable length for connection to an ET107, CS110, or retired Metdata1. An –LQ model has a user-specified cable length for connection to a RAWS-P weather station. If a sensor does not have an –L or other –LX designation after the main model number, the sensor has a set cable length. The cable length is listed at the end of the Description field in the product’s Ordering information. For example, the 034B-ET model has a description of “Met One Wind Set for ET Station, 67 inch Cable.” Products with a set cable length terminate, as a default, with pigtails. If a cable terminates with a special connector for a unique system, the end of the model number designates which system. For example, the 034B-ET model designates the sensor as a 034B for an ET107 system. –ET models terminate with the connector for an ET107 weather station. –ETM models terminate with the connector for an ET107 weather station, but they also include a special system mounting, which is often convenient when purchasing a replacement part. –QD models terminate with the connector for a RAWS-F Quick Deployment Station. –PW models terminate with the connector for a PWENC or pre-wired system. Where are the available cable termination options listed for a particular sensor? If a sensor is offered in an –ET, –ETM, –LC, –LQ, or –QD version, that option’s availability is reflected in the sensor model number. For example, the 034B is offered as the 034B-ET, 034B-ETM, 034B-LC, 034B-LQ, and 034B-QD. All of the other cable termination options, if available, are listed on the Ordering information area of the sensor product page under “Cable Termination Options.” For example, the 034B-L Wind Set is offered with the –CWS, –PT, and –PW options, as shown in the Ordering information area of the 034B-L product page. Note: As newer products are added to our inventory, typically, we will list multiple cable termination options under a single sensor model rather than creating multiple model numbers. For example, the HC2S3-L has a –C cable termination option for connecting it to a CS110 instead of offering an HC2S3-LC model. For the 107, 108, and 109 temperature sensors/probes, where within the white cylinder is the thermistor actually located? The thermistor is located approximately 3 mm (0.125 in.) back from the probe tip. What type of field check can be done on a temperature sensor or a temperature and relative humidity sensor to determine if it is within the range of specified accuracy or if it requires calibration? Note the difference between calibration and a field check. Calibration cannot be done in the field, as it requires an experienced technician and specialized equipment. Find a second sensor of the same type as the installed sensor whose data is in question. The second sensor will be used as a benchmark sensor and should be known to be accurate or recently calibrated. At the site, take readings using both sensors under the same conditions. The best practice is to measure both sensors side-by-side at the same time. Note that the sensors will never have the exact same measurement. Depending on the sensor model, if the difference in the readings of the installed and benchmark sensors is greater than the sum of the accuracies for both sensors, either return the installed sensor to Campbell Scientific for calibration or replace the appropriate chip. The 107, 108, 109, 110PV-L, and BlackGlobe-L temperature sensors can be calibrated. The HC2S3-L and HMP155A-L temperature and relative humidity sensors can be calibrated. The CS215-L has a replaceable chip for temperature and relative humidity. For more information, refer to the “Maintenance and Calibration” section of the CS215 instruction manual. The HMP60-L has a replaceable chip for relative humidity only. For more information, refer to the “Maintenance” section of the HMP60 instruction manual. What are the different cable termination options available for Campbell Scientific sensors? The –PT (–PT w/Tinned Wires) option is the default option and does not display on the product line as the other options do. The cable terminates in pigtails that connect directly to a data logger. In the –C (–C w/ET/CS110 Connector) option, the cable terminates in a connector that attaches to a CS110 Electric Field Meter or an ET-series weather station. In the –CWS (–CWS w/CWS900 Connector) option, the cable terminates in a connector that attaches to a CWS900-series interface. Connection to a CWS900-series interface allows the sensor to be used in a wireless sensor network. In the –PW (–PW w/Pre-Wire Connector) option, the cable terminates in a connector that attaches to a prewired enclosure. In the –RQ (–RQ w/RAWS Connector) option, the cable terminates in a connector that attaches to a RAWS-P Permanent Remote Automated Weather Station. Note: The availability of cable termination options varies by sensor. For example, sensors may have none, two, or several options to choose from. If a desired option is not listed for a specific sensor, contact Campbell Scientific for assistance. Need help building a system?